It is my great pleasure to welcome you all to the OECD Policy Forum on the Future of Work, on the day before the OECD Ministers of Labour and Employment convene for their Ministerial meeting. Your substantive discussions today will provide invaluable feedback in addressing the labour market challenges and opportunities created by the deep technological, social and economic evolutions in our societies. 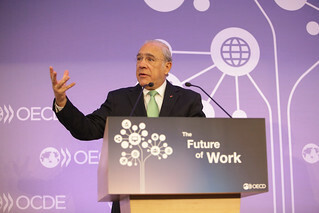 14 January 2016 - Angel Gurría, Secretary-General of the OECD speaking at the opening of the Policy Forum on the Future of Work. OECD Conference Centre, Paris, France. Globalisation, demographic trends and technological change are transforming jobs in our economy. The overall organisation of work and the skills needed in the workplace are undergoing profound and rapid changes. It is imperative for us to remain ahead of the curve and to be able to provide the necessary tools for workers, companies and labour markets to adapt to these changes efficiently. But how is work evolving? Let’s begin with the exponential growth in computer processing power. Digital devices are increasingly doing things that only human beings could do just a few years ago. Computers can now do our taxes, provide legal advice and will soon be driving our cars. Many people are worried that these changes are contributing to decreased employment, wage stagnation and growing inequality. But while there is certainly a transition cost to technological change, technical progress is ultimately the driver of productivity, which can in turn support higher wages, better quality jobs and more inclusive societies – provided the right policies are put in place. OECD analysis of ICT employment over the last 20 years shows that ICTs may have negative effects on employment for a limited period and these effects tend to disappear over time. What is clear is that the digital revolution is radically changing the nature of jobs in our economies, creating more demand for high-skilled jobs and for some non-routine, low-skilled jobs but much less demand for jobs often involving routine tasks. In Europe, the labour demand for abstract skills has grown 20% while the demand for routine skills has decreased almost 20% from the mid-1990s to 2010. This process is inherently disruptive. Focusing policies on upskilling and accompanying workers in the transition to new jobs is absolutely necessary, not only to facilitate the transition to more productive economies, but also to reduce the long-term social costs of the transition. The already massive skills mismatches will only grow over time unless we urgently put in place the right policies. Evidence from the OECD Programme for the International Assessment of Adult Competencies (PIAAC) shows that the proportion of workers with insufficient ICT generic skills is 9% for communication and information-search and 40% for office productivity software; while 55% lack the basic competencies in problem-solving in technology rich environments. This is a clear indication of the need to accelerate our policies to improve skills and thus strengthen the conditions for inclusive growth. At the same time, the sharing economy and the gig economy are challenging labour market institutions which are based on the traditional employer-employee relationship. They are questioning the very definition of what is a ‘job’, as workers can now easily hold multiple jobs, be on-demand at any hour of the day and run new forms of ‘virtual’ businesses. This is, for example, the case of Internet platforms that have emerged as major actors in the digital economy, providing marketplaces for information, goods and services. They give employers the possibility to have access to a large pool of skills and experience, at lower costs of hiring and administration. These arrangements seem very suitable for SMEs, local governments and social entrepreneurs and may contribute to more inclusive labour markets. They also provide workers with the opportunity to manage their working time independently, choose the place from which they work, and possibly in some cases achieve a better work-life balance. However, these arrangements also raise a number of possible concerns such as long working hours, high stress and lack of support. Platform-based workers are likely to face the same problems as those in non-standard work. These challenges pose profound questions to our labour market institutions and to policies regarding workers’ rights, taxation, pensions, health and social security; they therefore need to be addressed urgently in order to avoid deepening existing inequalities in the labour market. History has taught us that it is only natural for changes to be met with fear and resistance. In the past, the world of work has undergone massive transformations such as those ignited by the mechanisation of agriculture, electrical power and the advent of mass production. Workers and opinion makers in the past feared that these transformations would lead to job destruction and even to “the end of work”. Ultimately however, most of what we saw was progress towards better societies. Countries should thus adapt, and are courageously adapting to these changes. France, for example, is in the process of reviewing the conditions under which legislation can best promote the digital economy and ensure inclusiveness. Germany is engaged in public consultations on how to adapt its labour market and social institutions to the new forms of work. The United States Department of Labor held a major symposium on the future of work last month. Policymakers need to ensure that new technologies become an opportunity and not a threat; thus helping workers, businesses and society navigate through these transformations. In this context, social dialogue will become ever more important and social protection systems will need to adapt accordingly. This Forum marks the launch of the OECD’s new activity on the Future of Work which will provide policymakers and stakeholders with evidence-based analysis and good practices on what countries are doing to future-proof their labour market policies. This activity is also part of broader OECD initiatives, such as the digitalisation of the economy and the new OECD Jobs Strategy which, I hope, tomorrow Ministers will ask the OECD to prepare. Ministers in charge of the digital economy will be meeting in Cancun, in June, and will also focus on these issues. This Forum is designed to create a platform of discussion on how policies can take into account the changing nature of work, how we can support workers through these transitions, harness innovation, and expand opportunities. In turn, these policy responses require a whole-of-government and whole-of-society approach with the active participation of not just policymakers, but also trade unions, employers, training institutions, public and private employment services and researchers. They all need to be on board to make sure that the Future of Work brings more and better jobs for better societies.